The summer and fall months are perfect for meeting new people while exploring the great outdoors and learning about the preservation of the environment and the Sierra Club provides all of this. “Explore, Enjoy, and Protect the Planet” is the Sierra Club’s motto and members and nonmembers can explore the outdoors with the Club’s many outings. There are three parts to the Club’s outings: local, national and international. Another outings offshoot are the Inner City Outings in which the Sierra Club visits urban areas giving these residents the op portunity to explore the outdoors – many urban residents never have the chance to visit rural areas. The Sierra Club Northwest Cook County Group, which serves Park Ridge to the Cook County section of Barrington and south to Schaumburg and Elk Grove Village offers a variety of outings for all skill levels – from easy to more strenuous hikes to canoe trips to cross country skiing during the winter. For more information about outings, including pricing information (most outings are only $3) check out both the Northwest Chapter’s and the Illinois Sierra Club’s pages. You don’t need to be a member of the Sierra Club to attend the outings and, even if you live in the Northwest Cook County region you can still attend outings throughout the state or the country as well. Some upcoming outings presented by various groups throughout the state include the Wilderness Act Celebration at Lusk Creek (Shawnee National Forest) on Saturday, August 9; Cycling the Oak Savannah and Prairie on Sunday, August 10; Adopt a Trail Work Day – Illinois Prairie Path in Glen Ellyn on Saturday, August 23; Sand State Forest Exploratory Backpack on Sunday, September 7 and South Kettle Moraine Beginner’s Backpack Friday, September 19-Sunday, September 21. And, if you have more of an interest in the environment and conservation and would like to be surrounded by other like-minded individuals, the Northwest Cook County Group has monthly program meetings the second Thursday of every month at 7:30 pm with a time to socialize beforehand at 7 pm. Light refreshments will be served. Currently the meetings are held at the Spring Valley Nature Center, 111 E. Schaumburg Rd. in Schaumburg. Meetings are free and open to the public. Be sure to check the Group’s Web site for the meeting’s topic. So, here it is July – the middle of the summer, which means for many of us, including myself, bug bites! Bugs, especially mosquitoes, love, love the taste of my blood – I don’t get it – I break out in terrible painful welts, but I hate using harsh chemicals to protect myself from these nasty bites. Thankfully there are some natural alternatives to regular bug sprays, especially any containing N-Diethyl-meta-toluamide, or, more commonly known as DEET. A common ingredient in many over-the-counter insect repellents, DEET is a colorless yellow oil which works as a true repellent to mosquitoes. Even though DEET is a miracle ingredient for those of us who serve as a buffet to mosquitoes and other biting insects, it has been found that DEET has been found to inhibit the activity of a central nervous system ensyme acetylocholinesterase, which in essence, plays a role in the function of the neurons which control muscles. DEET has also been known to have effects on the environment including. It has been found have a slight toxicity for coldwater fish such as rainbow trout and tilapia and it also has been shown to be toxic for some species of freshwater zooplankton. So, you’re wondering what can I use instead of a chemical-based insect repellent? I don’t want to use chemicals or expose others or the environment to DEET or other chemicals. There has to be an alternative. There are! You can find natural alternatives on the shelves of such stores as Whole Foods or Trader Joe’s, or even just the common grocery store or big box store. Natural and chemical-free is becoming more the norm nowadays. Personally, I’ve had luck with Burt’s Bee’s All Natural Outdoor Herbal Insect Repellent, which contains such key ingredients as peppermint oil, cedar and lemon eucalyptus. If you want to try your hand and making your own easy, inexpensive bug sprays or creams you can find many recipes online, including this recipe: http://tinyurl.com/mmbuv2c. Of course, ridding your area of any standing water helps prevent mosquitoes – standing water is just a breeding ground for these pests. 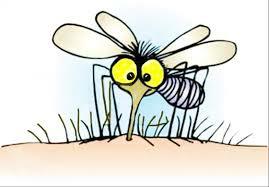 Also, check the mosquito forecast – if it’s high then stay indoors or at least in a screened-in area. And, proper clothing is key – wearing clothing that covers your arms and legs minimizes your chances of being bitten by mosquitoes or other biting insects.